I’m going to admit right now that this post is completely biased. I was not only a speaker at TEDx Hradec Kralove but I was also involved in some of the speaker selection and quality sessions. And, I want to make it clear that I’m not able to fully compare TEDx Hradec Kralove to any other TEDx events in this country. Although I’ve watched other Czech TEDx presentations online, this is the first TEDx that I’ve attended. As you can probably guess, I thought TEDx Hradec was fabulous. Although I’m usually known for being a harsh critic, I think it’s important to talk about what went right at TEDx Hradec so that it can serve as a model for other TEDx and similar events in this country. I was asked by the TEDx Hradec organizers to help with speaker selection and quality a few months before the event. We had a couple of speaker feedback sessions and lots of communication in preparation for the event. I could see the organizers’ dedication to quality and attention to detail in these sessions. They were clearly committed to making this a great experience for everyone. Being a TEDx organizer is a completely volunteer position, but in this case that didn’t mean that they weren’t professional. It was refreshing to see. Lesson: If you want to organize a TEDx event, make sure you’re passionate about making it a success. There are no material rewards for something like this so don’t expect something tangible in return for your efforts. But, if you put your heart and soul into finding speakers, organizing volunteers, promoting the event and going through the inevitable last-minute emergencies, you’ll find that the reward is in the audience’s experience and their appreciation of a job well done. 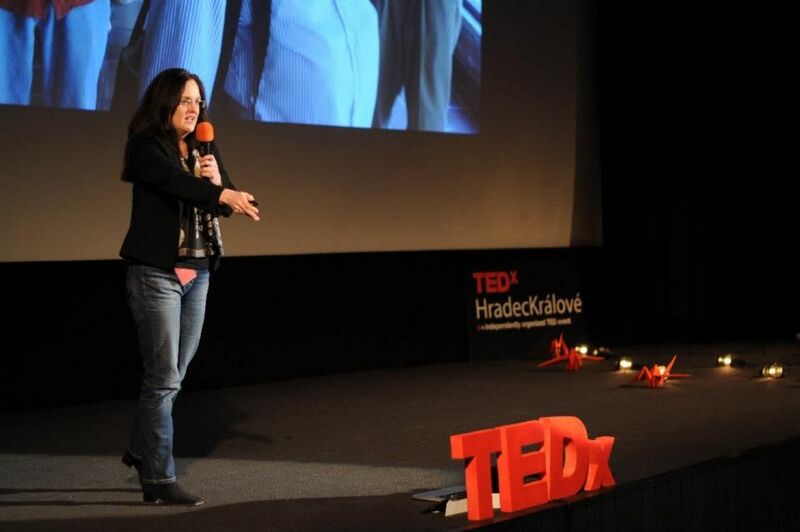 The presentations at TEDx Hradec weren’t perfect. But, I have to say that this is part of what made them so engaging. They were real people with real stories taking a few minutes to share them with us. We learned, among other things, what it was like to travel the world in a Trabant, what living in a yurt is like and how blogging can be a form of therapy to fight depression. These talks were presented with passion and a real desire to share something important with the audience. Lesson: In my opinion, TEDx isn’t a place for slick, professional presentations. It’s a place in which interesting people from the community have the opportunity to share their ideas and experiences. The emphasis should be on stories that will trigger emotion in the audience and compel them to share this experience with others after the event. Look for passion & and an urgency to communicate and you’ll find the right kind of TEDx presenters. Part of the TEDx license agreement is the obligation to show some recorded TED presentations during the event. The selection at TEDx Hradec was incredible. All of the presentations were inspiring, emotionally poignant and absolutely relevant to the motto of Ideas Worth Spreading. There are thousands of presentations to choose from and I applaud the organizers for selecting the ones that enhanced our TEDx experience. Lesson: This part of organizing a TEDx event must take ages! When you’re preparing this part of the event, do an audience analysis (I assume that the organizers know who the audience is well in advance of the event) and try to figure out what kind of presentations will be the most relevant and inspiring for them. Try not to focus on the famous presentations that everyone has seen. Find those hidden jewels that will surprise and entertain your audience. At the end of my presentation I gave the audience four things I’d like them to work on. One of them was to set a goal for themselves to meet three new people at every event. Almost everyone in the audience came up to me during the after-party, introduced themselves and said that they took my request seriously, ignored their fear of rejection and met at least three new people. Fabulous! I was thrilled to see so many people try something new and scary and take advantage of this opportunity. There was also an almost tangible feeling during the after-party of everyone enjoying themselves and talking about the ideas that had been presented. Lesson: I think one reason for this great mix of people was the accessible price (only 350CZK!). This opens up an event like TEDx to people who wouldn’t consider going to an expensive marketing or technical conference. And, I think that’s part of the spirit of TEDx. While TED is an extremely expensive and inaccessible event for most people, TEDx is absolutely different in this respect (according to the license agreement, a ticket must never cost more than $100). And that’s the reason that, in addition to the creative professionals that are usually at these kinds of events (regardless of the price), there were students and even a few families. That adds to the flavor of the experience, I think! This was not a posh, commercial event with glossy brochures and celebrity speakers. And, I think this was a strength. Throughout the day, there was the feeling of people caring enough to invest their time and energy to making this event as amazing as possible. From the many volunteers setting things up early in the morning, to the lovely people from UDiF giving attendees some interesting science experients to play with during the breaks, to Berka & friends making and serving delicious food- this was community spirit in action and I loved it! Lesson: I think if you ask people to help you make an amazing local event (and they know that it’s non-profit for everyone), they will come through. TEDx, in my opinion, is about spreading great ideas throughout your local community. And, there are true believers in that community who will be willing to put in the effort to help make it a fabulous event. Don’t be afraid to ask them. The feeling of bringing something outstanding to the community you care about is priceless! Thanks to all the TEDx Hradec Kralove organizers, volunteers, speakers and the audience for making my first TEDx experience a fabulous one! This entry was posted in Events by Jeanne Trojan. Bookmark the permalink.